MTK Global put on a show at the Emirates Arena in Glasgow on Friday that included a host of up and coming local fighters. Top of the bill was Glasgow’s own Kash Farroq making his first defence of his British Bantamweight title against Iain Butcher from Motherwell. The 22 year old Farooq won the belt in September when he knocked out Jamie Wilson in under a minute, that was his 4th win by KO in his last 4 fights. Facing Farooq was the experienced former flyweight European champion Butcher. Farooq took control of the fight from the off, with slick movement and peppering Butcher with body shots and good combinations. Butcher was a game opponent though and although being out boxed kept coming forward. In the 5th round it looked like Farooq had Butcher in trouble and Farooq sensed this, looking for the KO however Butcher came out in the 6th and was still in the middle of the ring. Farooq and his corner sensed they had hit Butcher with their best shot and he wasn’t going down so played the long game, winning the rounds and out boxing Butcher (18-4). The judges scorecard reflected Farooq’s dominance, 120-109, 120-108 and 118-110. Farooq’s coach, Craig Dickson said, “I think Kash gave a glimpse of the great potential he has. He barely took a shot in the first 6 rounds and showed some of the skills we’ve seen in the gym. His movement, balance and shot selection were great. He rolled with most of the shots that came his way but also showed he’s got a chin when he was caught flush in the second half of the fight. I asked Dickson when we are likely to see Farooq back and what about a potential fight against another up and coming Scottish Bantamweight, Edinburgh’s Commonwealth champion Lee McGregor. Also on the card Kieran Smith recovered from a knock down to win the WBC International Silver Super Welterweight title, beating Evaldas Korsakas by unanimous decision. This was a good workout for Smith (13-0), having won at the start of November in under a minute, this was a rematch against Korsakas (9-6-2), who had went on a 7 fight undefeated run. Smith survived the scare early in the fight to record a knock down of his own and won fairly convincingly. 95-93, 96-92, 96-93. Possibly the fight of the night was the much anticipated bout between Edinburgh’s Lewis Benson and Belfast’s Tyrone McKenna, both boxers were coming off defeats but put on a great fight for fans. McKenna (17-1-1) was always looking to move forward and land the heavy shots however Benson appeared the more skilled boxer on the night, slipping and jabbing. It was an intriguing contest and the general consesus was Benson had won the fight however the referee scored the bout in favour of McKenna, 96-95. Benson then said he was retiring in the post fight interview and said he had requested that the fight be judged by 3 judges before he took part, a request which was obviously ignored. Hopefully Benson (10-2) has reconsidered his decision away from the heat of the moment as he has a lot to offer despite losing his last two, both close decisions. A rematch would make the most sense. Ukashir Farooq beat Iain Butcher by unanimous decision. 120-109, 120-108, 118-110. Tyrone McKenna beat Lewis Benson by decision. 96-95. Kieran Smith beat Evaldas Korsakas by unanimous decision. 95-93, 96-92, 96-93. David Brophy beat Charles Adamu by decision. 60-54. Alex Dickinson beat Morgan Dessaux by decision, 60-54. Callen McAuley beat Eligio Palacios by decision, 60-54. Reece McFadden beat Elvis Guillen by decision 40-36. Kash Farooq makes the first defence of his British Bantamweight title, tonight at the Emirates Arena in Glasgow, Scotland. Farroq who won the belt in devastating fashion against Jamie Wilson faces another Scot, Iain Butcher from Motherwell. Both men should have big support in the arena with Farooq being from Glasgow and Motherwell only 10 miles away. Butcher (18-3, 5 KOs) is the more experienced of the pair, he is a former European Flyweight champion. Butcher last fought in June against Brett Fidoe and won a point victory. Butcher’s last defeat was against Charlie Edwards when he fought for the vacant British Super flyweight title, losing by unanimous decision. Farooq (10-0, 4 KOs) knocked out Dundee’s Jamie Wilson in under a minute back in September to claim the vacant British title. Farooq has also held the Scottish title which he won by TKO against Scott Allan in November last year. Farroq has won his last four fights all by TKO. 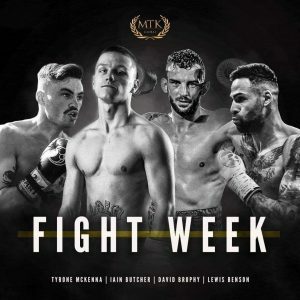 In a stacked card at the Emirates Arena, featuring a host of local talent, one fight that has had people talking is the fight between Belfast’s Tyrone McKenna and Edinburgh’s Lewis Benson. Both fighters have been going back and forth on social media in recent weeks and came head to head after the weigh in yesterday. Both boxers are coming off a loss, McKenna losing a unanimous decision to Jack Catterall for the WBO Inter-continental super lightweight title in June. That’s is McKennas only loss to date and has a record of 16-1. Benson also lost for the only time so far in June in Belfast. He lost to Johnny Coyle on points and has a record of 10-1. Both boxers will be looking to get back to winning ways and should make for a great fight. Also on the card is Kieran Smith (12-0) facing Evaldas Korsakas (9-5-2) for the vacant WBC International Silver Super Welterweight title. Smith was in action at the start of the month on the World Boxing Super Series card in Glasgow when he recorded a quick fire knock out win over Pavol Garaj. Last Thursday in Glasgow fight fans would see the vacant British Bantamweight title up for grabs. For the first time in 25 years a British title would be competed by two Scottish boxers at the prestigious St Andrews Sporting Club in Glasgow. Not since the meeting of Drew Docherty and Donnie Hood in 1993 has two Scots competed against each other for the accolade. This time it was Jamie Wilson from Dundee facing Kash Farooq from Glasgow. The fight was over after 71 seconds when Smith was blown away by Farooq. Smith was down after 15 seconds and would then be down another two times before the fight was stopped. On paper this was to be a stiff test for Farooq, Wilson had already challenged for the British title last year however he never had a chance to get going. There is an air of excitement around Farooq in Scottish boxing circles and this display would only add to that excitement. By winning the Lonsdale belt, Farooq created a bit of history by becoming the first boxer from a Pakistani background to have won a British title. 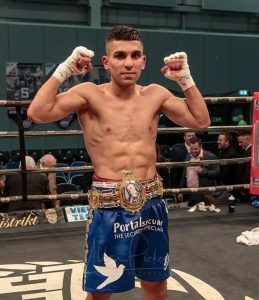 Farooq (10-0 4 KO’s) born in Pakistan, moved to Glasgow when he was a young boy and will now hope to emulate fellow Scot Josh Taylor, who takes part in the World Boxing Super Series next month, and compete on the world stage. 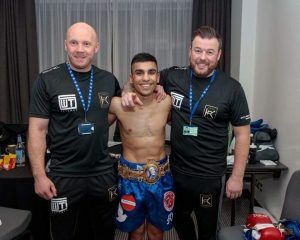 I caught up with Kash Farooq and asked him how it felt to add the British title to his Scottish belt? “It feels amazing. I could never imagine been a British champion that early in my career.” Farooq said. Did he expect the early finish? “Not really to be honest. I was expecting to go the distance but I found an opening and took my chance.” Farooq replied. With Edinburgh’s Lee McGregor taking on Cameroon’s Thomas Essomba later this month, there has been some talk of an all Scottish bout between McGregor and Farooq. Farooq, for one, would be happy to see the fight made. Farooq’s coach from Renfrewshire Boxing Club, Craig Dickson was happy with Kash’s performance and believes he has put the division on alert. “Kash’s win on Thursday shows he’s potentially levels above.” Dickson explained. “The way he went about dispatching Jamie was in a way only top pedigrees fighters do. He was patient, stalked his opponent and timed it precisely with perfect technique. The way he then finished Jamie was well measured and controlled also. Dickson would like to see Farooq take his time and build more experience in the division. “I would love Kash to have the domestic dust ups, create interest and big nights but more importantly make bigger money for him and his family.” Dickson said. Dickson, like many others believes Kash Farooq is destined for the top of the sport.